The newly elected president of Gambia had to be sworn in in Senegal, and Senegalese and other African military may be needed to force Gambia’s despotic president to relinquish power he’s held for 22 years. It was quite a contrast to events at the same time in Washington. The peaceful transition of power from one President of the United States to the next is a signature of our democracy, one that we hope to survive despite the unfitness of the new Chief Executive and Leader of the Free World. Watching the grace of President and Mrs. Obama as they welcomed President-elect and Mrs. Trump to the White House this morning could only bring tears to the eyes and a lump in the throat. There were many ceremonial moments that reinforced the continuity of government: outgoing and incoming president (44 and 45) traveling in a limo, both having denied the Presidency to Hillary Clinton, who, on split screen, is walking into the Capitol ceremony with her husband (42), and joining Jimmy Carter (39) and George W. Bush (43), all chatting amiably. But the new President was all about change. He gave the angriest inaugural address I can remember, one with serious international policy implications. Compared to the spontaneous ramblings of his rally speeches, his inaugural address was notable both for his longstanding campaign themes but also its compact structure, no ad-libbing, no attacks on the media, more use of “we” than of “I.” There was no acknowledgement of the more than half the country who had voted against him, many of them scared about his Presidency. Nor was there any gracious remark about his opponent, Hillary Clinton, as George W. Bush had made of his opponent, Al Gore. 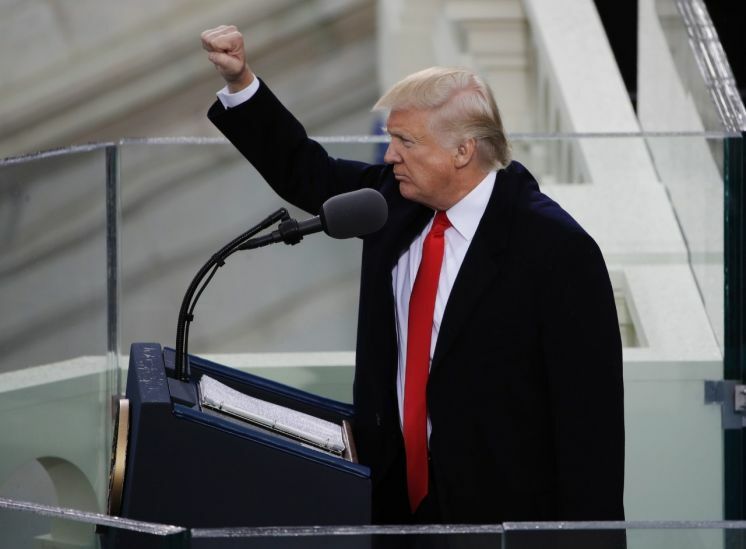 Trump’s speech was a populist manifesto, a declaration that all decisions would be made in the context of putting America First. The only policy hinted at was a pledge to rebuild roads, bridges, tunnels, airports and railroads. But right now his plans for doing so, depending on privatization, could hurt hardest the pocketbooks of those who put him in office. The speech had continuity, too. His address could as easily have been one of his hundreds of campaign speeches, painting a facts-optional picture of the despair of Americans, overrun by crime and drugs, borders unprotected, military depleted. He announced that the “American carnage stops right here and right now.” He spoke to those who had elected him, confirming their dark view of the world, fueling their anger at real and imagined enemies. But to those across the country who haven’t enjoyed the benefits of our growing economy, who have been left behind as factories closed and their dreams died, he displayed little honesty about the complexity of technology and globalization that have contributed to the despair. Trump also attacked the Washington insiders who surrounded him on the platform, including past presidents, for doing nothing even as they have feathered their own nests. “For too long, a small group in our nation’s capital has reaped the rewards of government while the people have borne the cost.” This comment, if he were serious about draining the swamp, could be promising, but it stood in contrast to his own ethical challenges and his cabinet nominees who, for the most part, have reaped the rewards of a rigged system. His rhetorical flourish, that “what truly matters is not which party controls government but whether the government is controlled by the people,” ignores that his plans are designed to further foster inequality and enhance those already at the top. There were phrases apparently included to reassure – “when you open your heart to patriotism, there is no room for prejudice” – but the constant “America First” refrain portends a nation comfortable abdicating a leadership role in the world, a nation not inclined to collaborate and build alliances. It’s hard to see how an unyielding America First attitude, without regard for the interests of others, will help the First Businessman solve international crises or negotiate agreements with our adversaries. One can only hope that the burdens of office will humble him and moderate his self-image and behavior. Like it or not, 45 is our new reality. This entry was posted in Uncategorized and tagged America First, Barack Obama, Bill Clinton, George W and Jimmy Carter, Hillary Clinton, inaugural address, Make America Great Again, Michelle Obama, Peaceful transition, Trump inauguration. Bookmark the permalink. Trump sounded more like the demagogic Bernie Sanders than a Republican. Instead of pledging bedrock Republican smaller government goals, he spoke of expanding wasteful big government infrastructure projections and irrational protectionist policies. It confirmed that he is an ignorant populist not a Republican.